The weather is turning cold and culinary thoughts are going to pot, the soup-pot, that is. (I put that one in for Fred.) There are many recipes I’ve tried and kept and many I have yet to put to the test. This particular gem is very healthy. Not to worry, I’ll be whipping up some of the richer soups throughout the winter. Heat oil in a Dutch oven over medium-high heat. Add onion and the next 4 ingredients (through thyme) to pan; sauté 3 minutes, stirring occasionally. Stir in butter and mushrooms; sauté 3 minutes or until lightly browned. Add broth, rice, chicken, salt and pepper to pan; cook 3 minutes or until thoroughly heated, stirring occasionally. Yeild: 4 servings (1.5 cups). That will cure whatever is ailing you and the possibilities are endless! Gorgeous photo and great comfort dish! Let me know next time you make it. I’ll be over! Nice soup and superb photos as always. I do enjoy the mushrooms and I’m a big soup fan. Mom’s Saturday meal in the winter was homemade soup and fresh home made bread. I was incredible how many visitors she had on Saturday. I don’t think that my cousin Anna ever missed one! The weather is a bit cool today. I think you’ve just read my mind. I also want to do some leftover roast chicken and rice soup with mushrooms. I can have a huge bowl of this. What a gorgeous soup (and photo)! Those big pieces of mushrooms are so appealing, particularly when combined with thyme. 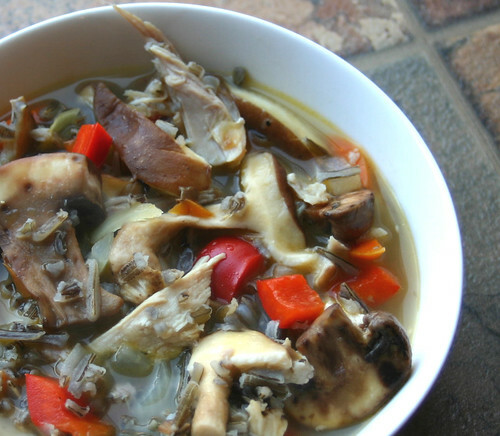 The peppers and mushrooms make for a gorgeous soup. And a wonderful pic! That soup looks so good! I like the huge pieces of mushrooms in there. Mouth-watering! I could eat mushrooms all day. made this last night. fantastic. i was leery, too many mushrooms…..i’m sold.